It’s already the 7th of January and I have yet to reflect on the past year or the one that’s already flying by. Had I not been hiding under my covers obsessing over the first season of “Downton Abbey” while fighting a cold with lots and lots of tea (please, please, please don’t be anything more than a simple cold), this weekend would have been perfect for pondering 2013: For thinking about a great full year at the newspaper, adopting an energetic puppy (and thus, staying healthy), traveling to San Diego and up the Pacific Coast Highway with Tom, celebrating at three weddings over the summer, trying (and failing) at gardening, baking plenty of new things, and so, so much more that my stuffed up head can remember. Instead, my sinsuses prevented any deep thoughts (aside from wondering if Lady Mary will ever find someone to marry? Don’t ruin it for me yet! ), and encouraged tea-drinking and bread-eating. Do you see that silver thing in the background? Thanks, Mom and Dad, for the new Macbook for Christmas!! And did I ever eat some bread. 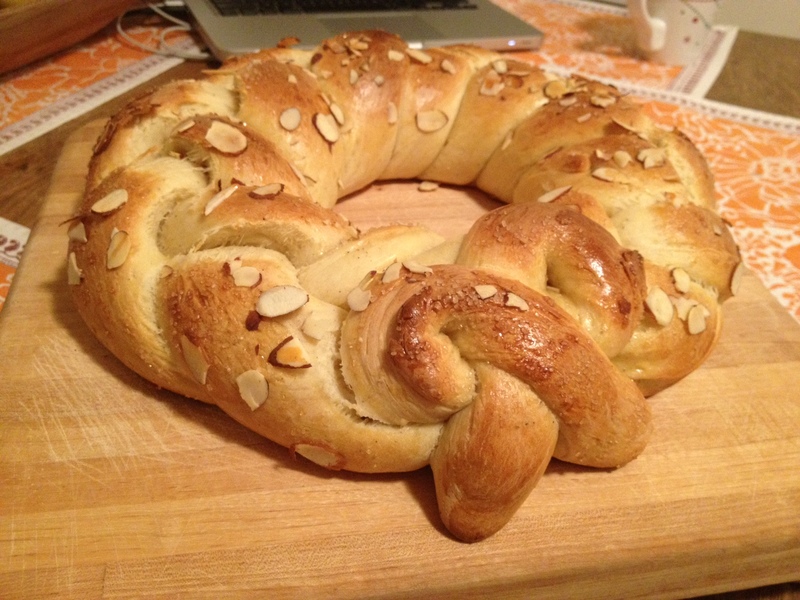 Over the past two days, I ate the majority of this loaf of Finnish Pulla, shaped like a wreath that would have looked just as lovely on our front door as the toasted pieces smothered with butter looked on my plate. This latest Tuesdays with Dorie recipe produced a wonderful, subtly sweet bread, dotted with cardamom. I’d definitely come back to it again, perhaps for a special occasion or for guests. Or for hunkering down to watch the Crawley family drama unfold (in fact, it may be great for a “Downton” themed tea party!). 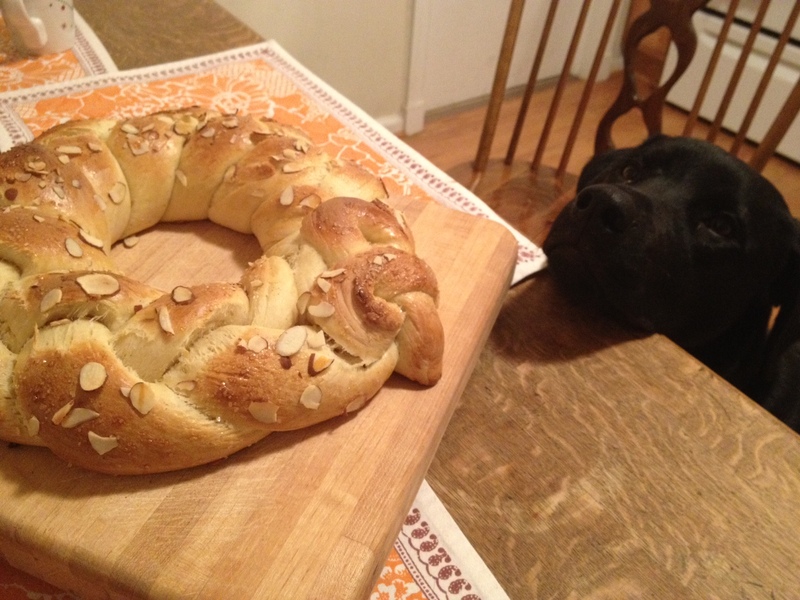 One creature that wanted to share this bread but was not permitted was Rachel. She kept nosing up to the table to try to lick the wreath or the butter dish–and even tried to put her paws up on the counter when I moved the cutting board. Oh no, oh no, oh no. I will NOT raise a counter dog! The small piece of leftover bread may be repurposed into one of my favorite comfort foods, bread pudding. That and rice pudding are the two things I always ask my mom to make for me when I’m sick. If only Rachel would make them for me. 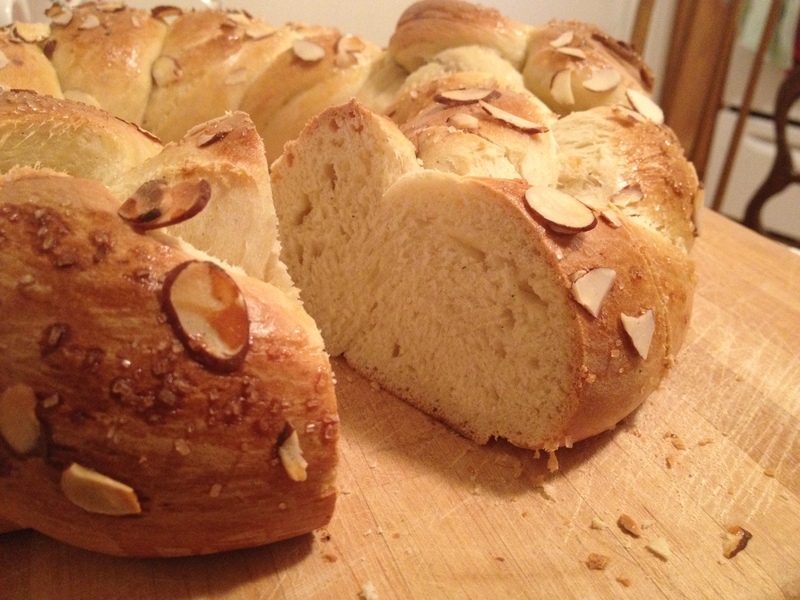 Find the Finnish Pulla recipe here. Read other Tuesday with Dorie bloggers here. Next up is a Pizza with Onion Confit and then a French Apple Tart. Such a treasure to have your grandparent’s mixer! Your wreath is lovely. Hope you feel better soon! Don’t forget that it is so yummy with lemon curd. Makes me want to have English tea and toast this afternoon!